Exact reproduction special steel clip set 14 piece. 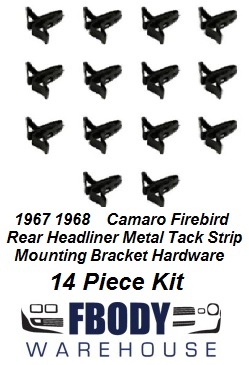 Used to retain rear headliner mounting tack strips in OEM thickness stamped steel. Replace your rusted or worn out clips today. Sold in a 14 piece set. Worldwide Shipping Available Use drop down menu below to select ship to location.